Fabrics used for embroidery are available in different thread counts and are available in cotton, linen, and blends. Your selection of fabric will depend on what you are planning to make and the embroidery technique you are using. Here's a basic run-down of the most common embroidery fabrics you will find in stores, as well as unconventional sources available in home stores. Tightly woven ​even-weave fabrics are best for surface embroidery, while loosely woven fabrics are ideal for counted thread, pulled thread and drawn thread techniques. The fiber content for evenweave fabric can be cotton, linen, rayon and polyester blends—or even hemp or bamboo. Evenweave fabrics are available in a wide range of colors, and the thread counts range from a fine, 32-count linen to a more rustic 18-count. Aida cloth is popular with cross stitchers due to its easy-to-count square pattern, but it can also be used for counted thread, Assisi embroidery or surface embroidery techniques. This cloth is woven with grouped fibers forming easy-to-follow squares in the fabric. With cross stitch, one stitch is worked over each square. 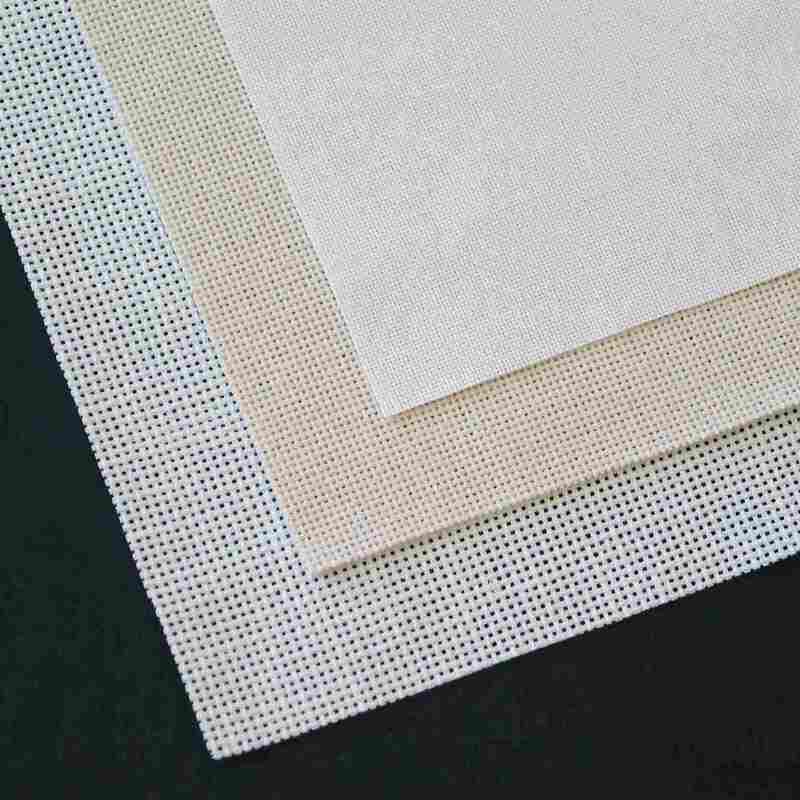 Aida is available in a wide range of solid colors, as well as background printed, patterned or textured varieties. Fiber content can be cotton, linen or rayon and it ranges in size from 11-count to 22-count (the count being the number of squares per inch of fabric). Herta cloth, a fabric with a large scale count of 6 squares per inch is technically an Aida, and is perfect for beginning stitchers because it is very easy to count. Hardanger fabric is a 100 percent cotton 22-count evenweave fabric. It originated in Norway and is woven with a double thread. Each double-thread group is counted as one. Hardanger can be used for hardanger embroidery, blackwork, cutwork, and counted thread techniques. When using hardanger fabric for cross stitch, it is worked over 2 thread groups, resulting in a count of 11 squares per inch. It is available in a limited selection of colors. Oslo fabric is similar to hardanger fabric and can be used in the same manner. A wide range of ready-made and by-the-yard toweling is available for embroidery and can be used to embroidery both contemporary and retro projects. Various ready-made items are also perfect for embroidery—especially surface embroidery techniques. Customize decor with embroidered sheets, pillowcases, and blankets. Or, dress up the dining room with embroidered napkins, placemats, and table runners embroidered to match your favorite dinnerware. Personalize a shirt or apron with a monogram or embroidered motif, and any bride or new mother would appreciate a gift from you embroidered especially for the event. You can even embroider on lampshades (like this one from LampsPlus) or on paper! The possibilities for embroidery on ready-made items is endless!